Here is a Close-Up Photo of the Crocheted Flower Necklace. Photo © 2009 Amy Solovay, Licensed to About.com, Inc. Here is a step-by-step tutorial that includes large-sized photos of the finished flower, as well as pictures showing how to do each step in the flower pattern. This flower is intended to be used as an embellishment for the coordinating choker necklace, but you can adapt it for other purposes if you prefer. This flower is a smaller variation of my crocheted frost flower, with several differences. 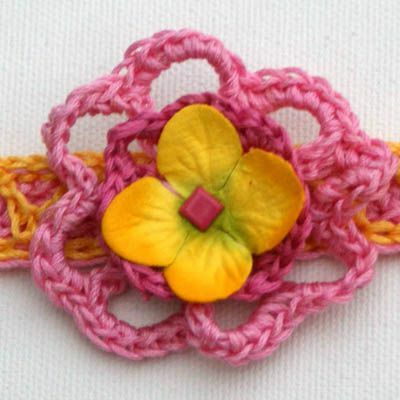 The larger flower was worked in worsted weight yarn; to create this smaller version for embellishing the necklace, use either embroidery floss or crochet thread. There is an extra petal in this version, which gives it more dimension and visual interest. This version is worked in two colors, while the frost flower was all one color. Beginning Steps for Crocheting a Flower Using Embroidery Floss. Photo © 2009 Amy Solovay, Licensed to About.com, Inc. This flower is worked in the round. Work in back loops of stitches until directed otherwise. Sl st to form a ring. Crocheting the Lower Layer of Flower Petals Using Embroidery Floss. Photo © 2009 Amy Solovay, Licensed to About.com, Inc.
You should have 8 flower petals all together in this round. Round 3: Sc into space formed by first petal of round 2. Work 5 more sc into the same flower petal for a total of 6 sc. End off, cut the yarn, and weave in the loose ends. Since you worked these petals into the back loops, the front loops are free to use for crocheting the upper layer of petals. View I shows a crochet hook inserted into one of the front loops. Crocheted Flower. Photo © 2009 Amy Solovay, Licensed to About.com, Inc. In round 4, you will be starting a new layer of flower petals. Rounds 4 and 5 will form the top layer of flower petals; in the photo above, rounds 4 and 5 are the darker pink layer of petals. 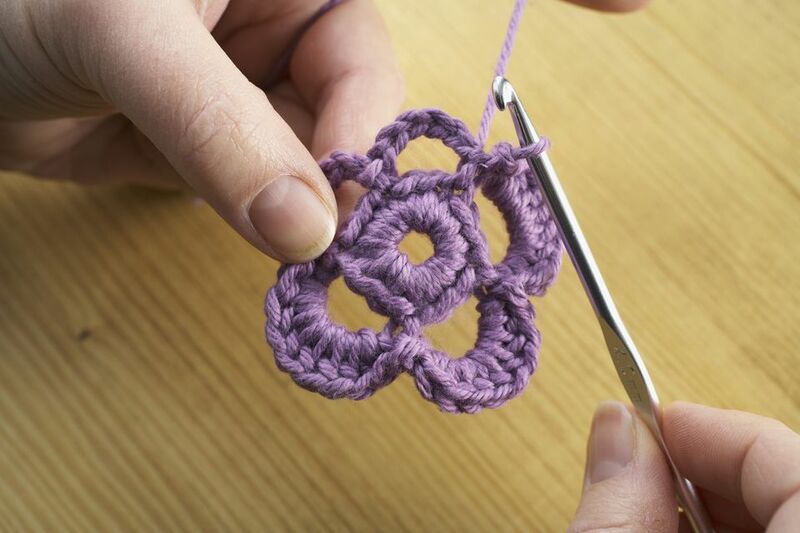 Work each petal in the front loops of the single crochet stitches formed in round 1. Round 4: Join new color of embroidery floss, draw up a loop and ch 4. (Skip the next sc in round 1. Sc in front loop of the following sc. Ch 4.) Repeat sequence in parentheses 6 more times. Sc in the same spot you began your chain for the round. Round 5: Work 4 sc in each petal all the way around the flower. Sl St to join. End off. Weave in loose ends. Here is a Close-Up Photo of the Crocheted Necklace. The Flower Was Embellished With a Faux Hydrangea Flower and a Yellow Brad. The Layered Flower Was Then Stitched to the Necklace Band. Photo © 2009 Amy Solovay, Licensed to About.com, Inc. The flower in the sample has been enhanced using a faux flower and a brad. Both of these items were originally intended to be scrapbooking supplies. If you scrapbook, take a look through your scrapping supplies to see if you already have a suitable flower and brad to use for your necklace. Even if you do not scrapbook, you might already own some baubles and trinkets that you could use to dress up your flower. I encourage you to take a look through your crafts supply stash. Perhaps you own a fancy button or some jewelry findings that you could use. If you don't mind doing a bit more work, you could also use one of the flowers from a stem of silk flowers. Rebecca Ludens has written a tutorial for re-purposing silk flowers. Her article was written for scrapbookers, but crocheters can use this technique too. Keep in mind that Rebecca used large flowers in her tutorial, but you would need to use smaller flowers. In the pink and black version of my crocheted necklace, the faux flower I used is from a stem of hydrangea flowers. Hydrangeas are a more appropriate size than large daisies are for this particular project. If you plan to make a whole bunch of these necklaces as gifts, Rebecca's method would be worthwhile; you could buy one stem of hydrangeas, and it would give you many suitable flowers to use. Crocheted Flower Necklace. Photo © 2009 Amy Solovay, Licensed to About.com, Inc. Here's how the finished flower necklace looks. Be sure to check out more free necklace patterns and more free jewelry patterns on our website.